Alright all you blogistani pre-med students, Dr. Moms and self-proclaimed experts, I have a quiz for you. 1. 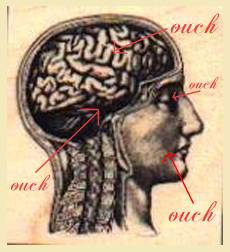 What does it mean when you have a headache on only the right side of your head? 2. Why have I had one for the last four days? Mefenac (Mefenamic acid) gets rid of the pain almost immediately, but I wanna know why my right eye, right ear, right side of my throat, right side of my jaw and the respective teeth all feel like they’re being sat on by a hippopotamus. A fat hippopotamus, holding an anvil. Other symptoms include slightly slurred speech (my teeth hurt so dang much that I don’t wanna close my jaw), sensitivity to noise and the feeling like my right eye is very, very small. I’ll probably go to the doctor tomorrow, but I think you guys should take a shot anyway. First correct diagnosis wins a custom ice-cream cone.